The environments in which people are born, live, learn, work, play, worship, and age affect a wide range of health, functioning, and quality-of-life outcomes and risks. Research on poverty indicates that lower income is linked to poorer health. The lower an individual’s income, the higher is his or her likelihood of disease and premature death. Furthermore, some research indicates that a higher risk of contracting an infectious disease may exist for those living in poverty. This study explored the potential existence of a relationship between income and Zika virus. Through analysis using 3.4.0 Version of the R Statistical Package, the median disposable income of the household was found to be significant in predicting the Zika virus counts. Specifically, the study looked at the relationship between household income and the risk of contagion in Cameron County, the southernmost county in Texas, which has been named as “Zika cautionary” by the Centers for Disease Control. Our analysis shows the existence of such a relationship, specifically that an increase in median disposable annual income per household in Cameron County of $100 per month was associated with a 15.6% decrease in the expected rate of occurrence of Zika Virus. Factors like education, neighborhood and physical environment, employment, and social support networks, as well as access to health care, affect the health of communities. (Artiga and Hinton 2018). Other factors include social and economic opportunities, resources and support available in neighborhoods and communities, the availability and accessibility of quality schooling, the availability of sufficient employment opportunities, the safety of workplaces, the cleanliness of water, food, and air, and the nature of social interactions and relationships. All these factors help to influence the strength of a community and its resiliency in responding to conflict or adversity (Patel et al. 2017). Classified as the Social Determinants of Health (SDOH), the environments in which people are born, live, learn, work, play, worship, and age affect a wide range of health, functioning, and quality-of-life risks and outcomes (Healthy People 2017). According to Healthy People 2020, five key determinants comprise the SDOH: 1) education, 2) social and community context, health and health care, 3) neighborhood, and 4) built environment and 5) economic stability (Healthy People 2017). As a determinant of health, education is expressed in terms of high school graduation rates, enrollment in higher education, language and literacy proficiency and early childhood education and development. Previous studies have found that low educational attainment, a lack of early childhood education and low or limited language and health literacy were associated significantly with poorer health outcomes and higher levels of health problems (Berkman et al. 2011; Lee et al. 2016). Furthermore, the mortality and life expectancy gaps between U.S. adults with the highest and lowest levels of schooling are significantly disparate (Hummer and Hernandez 2013). In fact, mortality rates for U.S. adults, ages 25 to 64 who have attended college, are less than half the rates for those who discontinued their education after completing high school (Hernandez and Martinek 2011). Healthy People 2020 defines social and community context as civic participation, discrimination, incarceration and social cohesion. Civic participation refers to individual participation in community experiences and encompasses a wide range of formal and informal activities. These behaviors benefit society and include activities such as voting, volunteering, participating in group activities, and community gardening (Healthy People 2017). Discrimination is a socially structured action. This action results in either unfair or unjustified and harms individuals and groups (Abramson et al. 2015; Luo et al. 2012). Discrimination and the results of discrimination can have a negative impact on the employment and salary of an individual, educational opportunities and likelihood of success, and availability of adequate and affordable housing in a safe neighborhood. It may also affect that individual’s health (USC 2016). Incarceration refers to the number of inmates under the jurisdiction of state or federal prisons or held in local jails (Healthy People 2017). Together, the constructs of civic participation, discrimination and incarceration, influence social cohesion. Social cohesion, or the strength of relationships and the sense of solidarity among members of a community, shape interpersonal trust among community members, and an individual’s sense that they belong and are supported in their community (Arcaya et al. 2015; Lin 1999). Additionally, research indicates that social cohesion also is related to income. 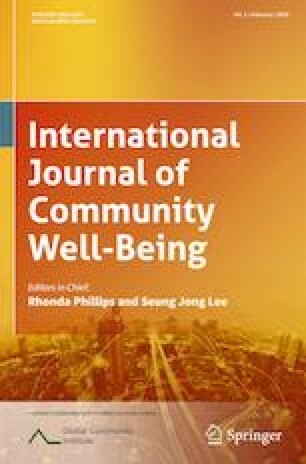 The higher the level of income equality in a community, the greater is the sense of social cohesion and personal interconnectedness felt by residents (Kawachi and Kennedy 1997). High levels of social cohesion can influence health outcomes positively through behavioral and psychological pathways (Berkman and Glass 2000; Uchino 2006). Health and health care suggests that access to health care, including primary care, as well as health literacy affects health. Those individuals who face obstacles entering the health care system or have difficulty in understanding the health system face significant challenges. Health system barriers individuals may face include: limited or no health insurance coverage, a lack of affordable care, inadequate or unreliable transportation, physician shortages (especially shortages in primary care providers) and lack of culturally competent providers. Lack of access to care that responds to the individual’s culture or language needs often impedes health options and treatment. Regardless of the barrier, however, limited access to health care services and as well as challenges comprehending health information increase the risk of poor health outcomes (Call et al. 2014; Douthit et al. 2015; National Association of Community Health Centers and the Robert Graham Center 2007). Neighborhood and built environment, as related to health, is the physical infrastructure of a community. This includes access to foods that support healthy eating patterns, quality of housing, crime and environmental conditions (Healthy People 2017). A lack of full services grocery stores (those offering fresh and frozen meats and poultry; canned, fresh, and frozen fruits and vegetables; dairy products; cereals; canned fish; bread products; and infant food and formula), crumbling or neglected buildings, civil unrest and violence and, pollutants in the soil, air or water have the potential to negatively affect health. An inadequate neighborhood can create an environment ideal for chronic diseases, such as obesity, respiratory diseases including asthma, lung cancer and mesothelioma as well as mental illness such as stress, depression and anxiety (Lavin et al. 2006). Economic stability is characterized by employment, food insecurity, housing stability, and poverty (The College for Behavioral Health Leadership, 2017). Employment (job security, the work environment, financial compensation, and job demands) affects health. Research indicates that full-time employment predicts slower declines in perceived health and in physical functioning for both men and women (Ross and Mirowsky 1995). Food insecurity, or the disruption of food intake or eating patterns because of lack of money and other resources, increases the risk for a variety of negative health outcomes and health disparities (Nord et al. 2005). These negative health outcomes including obesity and higher rates of chronic disease (Healthy People 2017). Further, food-insecure children may be at an increased risk for a variety of negative health outcomes, including obesity, developmental problems and issue with mental health. Housing instability encompasses a number of challenges, such as having trouble paying rent, overcrowding, moving frequently, staying with relatives, or spending a disproportionate portion of the household income on housing (Healthy People 2017). These housing instability related incidents may negatively affect physical health and make it more difficult for individuals to access health care (Cutts et al. 2011; Kushel et al. 2006; Meltzer and Schwartz 2016). Research on poverty indicates that higher income is linked to better health. The lower an individual’s income, the greater is the likelihood that he/she will face disease and premature death (National Center for Health Statistics 2012). Low-income adults are almost five times as likely to report being in fair or poor health as adults with family incomes at or above 400% of the federal poverty level (Braveman and Egerter 2008). Low-income American adults have higher rates of heart disease, diabetes, stroke, and other chronic disorders than wealthier Americans (Urban Institute and Virginia Commonwealth University 2015). In addition to chronic disease and premature death, income is associated health factor of concern with respect to the spread of infectious disease. Some research has indicated that a higher risk of contracting an infectious disease may exist for those living in poverty (National Public Radio 2016; Harvard School of Public Health 2017; Patz 2017; Shrivastava et al. 2017). For example, Patz noted that some “communities that are likely to face even greater threats than the general population from these diseases. Individuals,” he said,” living near or below the poverty line are at higher risk of exposure to the mosquitoes that carry Zika virus” Patz 2017). Indeed, Shrivastava et al. noted with respect to Zika transmission and Brazil that “two major modes, namely mosquito bites and sexual transmission, have been identified for the disease transmission, both of which are related with poverty and health inequality. The disease has been quite predominant in regions to favorable breeding conditions for mosquitoes like poor drinking water supply and substandard sanitation facilities” (Shrivastava et al. 2017). Because the conditions in which individuals live partially explain why some people are healthier than others, the link between SDOH and individual health has become a topic of concern and study for public health professionals. This research explored in depth one SDOH (economic stability) and the potential existence of a relationship between economic stability and the spread of Zika virus, an infectious disease. Zika is caused by a virus that can be passed from a pregnant woman to her fetus and from a person who has Zika virus to his or her sexual partners. When transmitted from mother to fetus during pregnancy, the infection can result in microcephaly (smaller than normal head size), abnormal brain development or the loss of brain tissue. The virus may also cause and other malformations in an infant including limb contractures, high muscle tone, eye abnormalities, and hearing loss (Basarab et al. 2016; Calvet 2016; CDC 2018; World Health Organization 2017). Zika virus can also be transmitted through transfusion of blood and blood products, and organ transplantation. However, the primary mode of transmission of Zika virus is through the bite of an infected Aedes species mosquito (Ae. aegypti and Ae. Albopictus). With an incubation period of approximately three to 14 days, the most common symptoms displayed by an individual infected by Zika virus are fever, rash, headache, joint pain, conjunctivitis, and muscle pain (CDC 2018; World Health Organization 2017). Zika virus was discovered more than six decades ago. However, the virus was not found in the United States until 2016 when on July 29 of that year, the Centers for Disease Control and Prevention (CDC) confirmed four cases of locally transmitted infection in Miami, Florida (Fauci and Morens 2016). Four months later, on November 28, one case was confirmed in Cameron Country, Texas (CDC 2018). According to the CDC, provisional data indicates that as of January 2, 2019, there were 5746 symptomatic Zika virus disease cases reported in the United States of which 5460 cases were associated with travelers returning from affected areas and 231 cases were acquired through local mosquito borne transmission (CDC 2018). Although not listed by the CDC as one of the ten most important public health problems, the Zika virus remains a concern for U.S. public health officials (Fauci and Morens 2016). While cases of Zika have declined, the infectious disease has not disappeared. According to the CDC, because Zika is endemic to the Americas, communities and individuals remain at risk for years to come (Sifferlin 2018). Because of this, our research sought to explore the relationship between economic stability and Zika virus. This analysis was exempt from Institutional Review Board (IRB) approval because it utilized existing data that was publically available. Data had no personally identifiable information and subjects could not be identified. The authors declare that they have no conflict of interest. Cameron County, Texas sits on the border between the US and Mexico (see Fig. 1). As of the census of 2010, there were 406,220 people, 119,631 households, and 96,579 families residing in the county. The racial makeup of the county was 87.0% White, 0.5% Black or African American, 0.4% Native American, 0.7% Asian, 0.03% Pacific Islander, 9.8% from other races, and 1.5% from two or more races. 88.1% of the population were Hispanic or Latino of any race. There were 119,631 households out of which 50.3% had children under the age of 18 living with them. The average household size was 3.36 and the average family size was 3.80. The population was 33.0% under the age of 18, 9.7% from 18 to 24, 25.6% from 25 to 44, 20.6% from 45 to 64, and 11.10% who were 65 years of age or older. The median income for a household in the county was $31,264, and the median income for a family was $33,770. Approximately, 30.0% of families and 34.7% of the population were below the poverty line (US Census 2018). According the Texas Department of State Health Services (DSHS), Cameron Country had the highest number of reported cases of confirmed Zika virus of any county in Texas. DSHS reported 329 Zika virus cases in Texas since the count began in 2015 (Texas Department of State Health Services 2018). The Cameron County Department of Health and Human Services (CCDSHS) reported 32 Zika virus cases in Cameron County from year 2016 and 2017 (until 1st of April 2017). These 32 Zika virus cases were reported from six zip codes (Fig. 1). Although Cameron county has 22 zip codes, demographic and Zika virus case information was available only for 16 zip Codes. Therefore, only these 16 zip codes were selected as the sample for this study (Table 1). Data regarding Zika virus occurrences in Cameron County were acquired from a public records request to CCDSHS. Demographic and socioeconomic information was collected using data from the Environmental Systems Research Institute (ESRI), Community Analyst and the US Census. Community Analyst is a web-based system operated by ESRI that allows researchers to analyze demographic and third-party sources of data to understand communities. ESRI’s data encompasses a wide variety of datasets that are updated quarterly, semiannually, annually, and decennially (U.S. Census data). For this study, eight demographic and socioeconomic variables were gathered from ESRI and utilized as the independent variables. Data analysis of Zika virus cases in Cameron County used the following independent variables: 1) the percentage of the population identified as Hispanic; 2) the percentage of the population made up of people at vulnerable ages (under age 9 [with under-developed immune systems] or over 65 [with deteriorating immune systems]); 3) the percentage of housing units that were renter occupied; 4) percentage of housing units that were vacant; 5) the median disposable income per household; 6) the average household size; 7) the average income available per person per household; and 8) the percentage of the population holding at least a bachelor’s degree. As seen in Table 1, ten of the 16 zip codes had no record of Zika disease occurrence thus, the Zero Inflated Poisson Regression Model was selected to analyze the data. The rationale for selecting this statistical model center on the Zero Inflated Poisson Regression Model’s ability to accommodate excess zeros and over dispersion in count data (IRDE 2018). In this analysis utilizing this model, two components exist: (1) zip codes where Zika virus exists or (2) zip codes where it does not exist. An observation of zero may occur in a zip code because the Zika virus simply was not observed at that time or because it did not exist there. In addition, because it is reasonable to assume that all the zip codes with no observed incidence of Zika virus have equal probability of belonging to Component 1 or Component 2, the simple Zero Inflated Poisson Regression Model was conducted. Data were analyzed using 3.4.0 Version of the R Statistical Package (The R Foundation 2018). The final fitted models found that only the median disposable income of the household was significant in predicting the Zika virus counts. In the sample, on average 81.6% of the population per zip code was Hispanic and 15.25% people were in a vulnerable age group. Approximately 20.7% of the housing units were renter occupied and 19.96% were vacant. Of the 16 zip codes studied, 42.73% reported an income of less than $30,000. Average household size was 3.3 and average income available per person per household was $10,832. Only 24% of the people who were more than 18 years of age had at least a bachelor’s degree, graduate/ professional degree, or an associate degree. Tables 2 and 3 present the results of the fitted model. As Table 2 illustrates, for Zika virus occurrence, only log of median disposable income (p = 0.0001)) was statistically significant. This means that, for one dollar change in income, the difference in the log of incidence rate is expected to change by −6.46, i.e., expected rate decreases by exp. (−6.46) = 0.156%. Hence, for a $100 increase in the median family income, the incidence rate is expected to decrease by 15.6%. This analysis demonstrates that the higher the income the less change an individual has in contracting Zika virus. Table 3 displays the actual and predicted Zika virus occurrences for each of the 16 zip codes. Note that, if the prediction value is in between 0 and 0.5, the prediction is considered as zero. The predictions are accurate with the actual Zika virus count with few exceptions. The link between income and health has become a topic of concern and study for public health professionals. With the resurgence of Zika virus as a public health concern, this study explores the potential existence of a relationship between income and Zika virus. In addition, other infectious diseases are on the rise, like mumps, measles, HIV and Ebola is back. So, other diseases exist that might be spread, and this research can help deal with these diseases before they begin to be a big problem. There is also an increasing income disparity in the United States and immigration and cross-border travel are on the rise. So, more cases may arise in the future. Cameron County was selected for this study because it sits on the border between the United States and Mexico and had the most reported cases on Zika virus in the state of Texas. According the DSHS, Cameron Country had the highest number of reported cases of confirmed Zika virus of any county in Texas. DSHS reported 329 Zika virus cases in Texas since the count began in 2015 (Texas Department of State Health Services 2018). In 2016, nearly 43% of the families in Cameron County had a median disposable annual income per household of $30,000 while zip codes 78,520 and 78,521 (those with large numbers of Zika virus cases among the selected 16 sample zip codes in Cameron County) had a median disposable annual income per household of $28,555 and $26,703 respectively. When compared to the median disposable annual income across the United States, households in Cameron County had roughly $19,000 less disposable income than other US households (Environmental Systems Research Institute 2017). Through analysis using 3.4.0 Version of the R Statistical Package, the median disposable income of the household was significant in predicting the Zika virus counts. 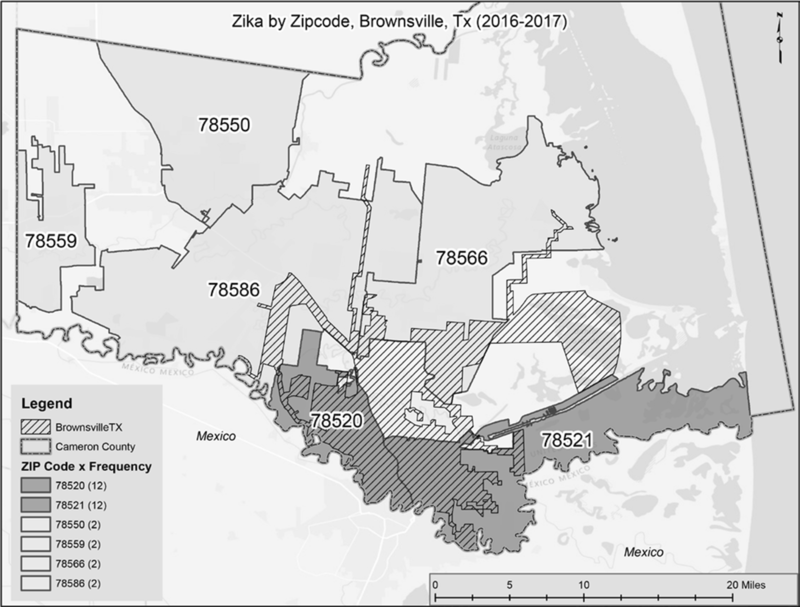 Specifically, the analysis of this study indicates that an increase in median disposable annual income per household in Cameron County of $100 per month was associated with a 15.6% decrease in the expected rate of occurrence of Zika Virus. This suggests that the more disposable income a family has the less chance members of a family unit have of contracting Zika virus. These findings support the significance of the relationship between health and income. Further research is needed to explore the link between median disposable income per household and infectious disease. Future research should examine income in other communities reporting cases of Zika virus. Study limitations are limited due to the small sample size. Artiga, S. & Hinton, E. (2018). Beyond Health Care: The Role of Social Determinants in Promoting Health and Equity. Kaiser Family Foundation. Retrived from http://files.kff.org/attachment/issue-brief-beyond-health-care. Braveman, P., & Egerter, J. (2008). Overcoming obstacles to health: Report from the Robert Wood Johnson Foundation to the Commission to Build a Healthier America. Princeton, NJ: Robert Wood Johnson Foundation. Retrieved from http://www.commissiononhealth.Org/PDF/ObstaclesToHealth-report.PDF. Accessed 14 Feb 2019. Centers for Disease Control and Prevention. (2018). Zika cases in the United States. Retrieved from https://www.cdc.gov/zika/reporting/case-counts.htm. Accessed 14 Feb 2019. Environmental Systems Research Institute. (2017). Tapestry segmentation. Available from https://www.esri.com/en-us/search#/?q=Tapestry%20segmentation&v=0&tab=Explore&page=1. Accessed 14 Feb 2019. Harvard School of Public Health. (2017). Spread of Zika raises issues of poverty, women’s rights. Retrieved https://www.hsph.harvard.edu/news/hsph-in-the-news/spread-of-zika-raises-issues-of-poverty-womens-rights/. Accessed 14 Feb 2019. Healthy People (2017). Social determinants of health. Washington, D.C.: Office of Disease Prevention and Health Promotion, U.S. Department of Health and Human Services. Retrieved from https://www.healthypeople.gov/2020/topics-objectives/topic/social-determinants-of-health. Accessed 14 Feb 2019. Hernandez, R., & Martinek, C. (2011). Which care first- better education or better Hhealth. The Regional Economist, April, 4-7. Retrieved from https://www.stlouisfed.org/~/media/files/pdfs/publications/pub_assets/pdf/re/2011/b/health_education.Pdf. Accessed 14 Feb 2019. IRDE (2018). Zero-inflated poisson regression | R data analysis examples. https://stats.idre.ucla.edu/r/dae/zip/. Accessed 14 Feb 2019. Kawachi, I., & B.P. Kennedy. (1997). Health and social cohesion: Why care about income inequality? BMJ, 314, 1037–1040. https://www.ncbi.nlm.nih.gov/pmc/articles/PMC 2126438/. Accessed 14 Feb 2019. Lavin, T., Higgins, C., Metcalfe, O., & Jordan, A. (2006). Health impacts of the built environment: A review. Belfast and Dublin: Institute of Public Health in Ireland. Retrieved from https://www.publichealth.ie/files/file/Health_Impacts_of_the_Built_Environment_a_review.Pdf.. Accessed 14 Feb 2019. Luo, Y., Xu, J., Granberg, E., & Wentworth, W. M. (2012). A longitudinal study of social status, perceived discrimination, and physical and emotional health among older adults. Research on Aging, 34(3), 275–301. https://doi.org/10.1177/0164027511426151. National Association of Community Health Centers and the Robert Graham Center. (2007). Access denied: A look at America’s medically disenfranchised. Washington, DC: National Association of Community Health Centers and the Robert Graham Center Retrieved from https://www.graham-center.org/content/dam/rgc/documents/publications-reports/monographs-books/Access%20Denied.pdf. Accessed 14 Feb 2019. National Center for Health Statistics. (2012). Health, United States, 2011: With special feature on socioeconomic status and health. Hyattsville, MD: US Department of Health and Human Services, Centers for Disease Control and Prevention, National Center for Health Statistics Retrieved from http://www.cdc.gov/nchs/data/hus/hus11.pdf. Accessed 14 Feb 2019. National Public Radio. (2016). Is the risk of catching Zika greater in poor neighborhoods? Retrieved January 22, 2018 from https://www.npr.org/sections/goatsandsoda/2016/06/16/482345540/is-the-risk-of-catching-zika-greater-in-poor-neighborhoods. Accessed 14 Feb 2019. Nord M, Andrews M, Carlson S. Household food security in the United States, 2005 [Internet]. Washington: USDA Economic Research Service; 2005. Report No. : ERR-29. Retrieved from: https://www.ers.usda.gov/webdocs/publications/45655/29206_err29_002.pdf?v=41334 [PDF – 880 KB]. Accessed 14 Feb 2019. Patel, S., Rodgers, M., Amlot, R., & Rubin, G. (2017). What do we mean by ‘community resilience’? A systematic literature review of how it is defined in the literature. PLoS Currents, Feb 1; 9 https://doi.org/10.1371/currents.dis.db775aff25efc5ac4f0660ad9c9f7db2. Patz, J. (2017). Preventing the spread of Zika requires addressing poverty. Retrieved from https://www.huffingtonpost.com/jonathan-patz/preventing-the-spread-of-zika-poverty_b_9800024.html. Accessed 14 Feb 2019. Ross, C., & Mirowsky, J. (1995). Does employment affect health? Journal of Health and Social Behavior, 36(3), 230–243 Retrieved from http://www.jstor.org/stable/2137340. Accessed 14 Feb 2019. Sifferlin, Alexandra. (April 17, 2018). Time. Do I still need to worry about zika? Retrieved from http://time.com/5241521/zika-virus-pregnancy/. Accessed 14 Feb 2019. South Texas Economic Development Center. (2018). Local business and small business update. Available from https://stedc.atavist.com/. Accessed 14 Feb 2019. Texas Department of State Health Services. (2018). Zika in Texas. Retrieved from http://www.texaszika.org. Accessed 14 Feb 2019. The College for Behavioral Health Leadership. (2017). Social determinants of health: Economic stability determinants. Retrieved from http://www.change4health.org/it-takes-a-village/social-determinants-of-health/economic-stability-determinants/. Accessed 14 Feb 2019. The R Foundation. (2018). The R project for statistical computing. Vienna, Austria: The R Foundation. https://www.r-project.org/. Accessed 14 Feb 2019. Urban Institute and Virginia Commonwealth University. (2015). Income and health initiative: Brief one. How are income and wealth linked to health and longevity. Retrieved from https://www.urban.org/sites/default/files/publication/49116/2000178-How-are-Income-and-Wealth-Linked-to-Health-and-Longevity.pdf. Accessed 14 Feb 2019. US Census. (2018). Quick Facts: Cameron County, Texas. Retrieved from https://www.census.gov/quickfacts/cameroncountytexas. Accessed 14 Feb 2019. USC. (2016). Is Discrimination Bad for Your Health? Retrieved from https://nursing.usc.edu/blog/is-discrimination-bad-for-your-health/. Accessed 14 Feb 2019. World Health Organization. (2017). The determinants of health. Retrieved from http://www.who.int/hia/evidence/doh/en/. Accessed 14 Feb 2019.